Started by Sergio Cornaga and finished by yours truly, Pump It!Chill Out is a odd hybrid level (by which I mean, it's two distinct levels stitched together) where you choose whether you'd like an exciting adventure or a more chillaxed experience. If you elect to PUMP IT, you'll be faced with a gauntlet (not a very hard one, but a nonetheless) of screens featuring the infamous red chaser enemy, somewhat synced to a piece by some guy I'm assuming Sergio really likes but I've never heard of (music's good tho, can't hate). If you, however, are not such an individual who would PUMP IT, you can simply... not. Going off to the left, you get to experience a somewhat nonlinear series of fairly simple puzzles, more interested in presentation than difficulty. Whether you choose pumping it, not pumping it, or both, I hope you enjoy this level. Very good level. I enjoyed the contrast between the two sections, either of which would have been solid games on their own. A few technical issues though with the Chill Out challenge. I spotted two Void screens up at the top. One at x992y995 and another at x995y995. These are both pretty easily accessed, and should be fixed asap! Silly me. Those issues have now been fixed. Thanks for the heads-up, Fubaka! Both were very well done! The music in Pump It may actually line up better than it did in Don't Stop Running... I especially liked how the jagged edges corresponded to the fake DJ scratching sounds. So I first tried pumping it, and after I died twice, I went to the much more calming and serene side. The puzzles in the chill out side were really great, too. Excellent use of what I'm assuming is some KS+ mechanics. I felt accomplished but none were ever really that difficult. My only complaint would have to be the lack of an intro/end. Even just the simplest end screen to show you put _some_ thought into it is better than that. You can always remove the Intro scene altogether. And occasionally I will put a single white end screen that says "FIN" just to show I thought about it and decided to keep a generic ending. Thanks for your kind words! 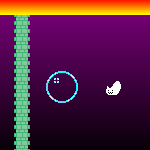 I have created some custom end screens and they should appear in an update to the level soon, assuming they meet Ultigonio's approval. Yes! As Sergio mentioned, he added in some ending scenes. Those are present in v1.2, which can be found up above or on the Nifforum thread.